Vagrant installation packages are available for OS X, Windows and Linux (deb and rpm format). Installation is simple “Next, Next, Next, Done” process and doesn’t require any special user interaction. I strongly suggest that you will install Vagrant from its website and not by using your package manager. A lot of times the official repositories contains very old versions of Vagrant. In this tutorial I will use Vagrant 1.6.5. Since Vagrant is not a virtualization software by itself, it relies on 3rd party providers for doing the virtualization part. For this tutorial I’ll assume you have installed Oracle’s VirtualBox. VirtualBox is a free multi-platform virtualization software which is supported by Vagrant out of the box. VAGRANT_HOME – This is the directory where Vagrant stores its global state. It can get quiet large since it will contain all the base boxes. on or want to submit bug report with log for example. provider most of the time, it would make sense to change the default. Providers are the components that enables Vagrant to use different virtualization solutions. Vagrant supports number of software hypervisors out of the box – VirtualBox and Hyper-V. Vagrant also allows adding additional providers via its plugins mechanism. For example you can add support for VMWare products as well as IaaS providers such as AWS. Provisioners allow Vagrant to bring machine into desired state by using simple shell scripts or different configuration management tools such as Puppet or Chef. Provisioning in Vagrant usually happens after machine initialization but can be initiated on demand. Configuration Management (CM) vs shell scripts: There’s nothing wrong to use Vagrant with simple shell script instead of a full blown CM system. In fact in this tutorial I will use shell as well in order to not over complicate the tutorial. However CM system like Puppet or Chef has certain principles behind them which can help you with provisioning of your environment. For example one of the main principles of CMs is Idempotence which is the ability to apply certain action number of times but be sure the result won’t change after the initial result. In environment you find provisioning to be helpful even after the initial provision, you should probably consider using CM instead of shell script. Boxes are vagrant packages that allows bundling provider specific machine data (such as vmdk disk images). These packages can be imported on any machine that runs vagrant. Vagrant allows sharing or syncing of folders from host machine to guest machine. This allows you to edit your files locally and see the changes in the guest machine. Sharing of folders depends on your provider, for example VirtualBox provides its shared folder mechanism. Vagrant also allows syncing by using tools such as rsync or network file share using NFS. Some providers such as VirtualBox allow running VMs in NAT network mode. In this mode the VM sits in its own private address space which is not accessible from the host machine. In this case port forwarding allows creating forwarding rules that will forward traffic from local port to the port of the virtual machine. Vagrant provides extendability via its plugins API. This creates possibilities to add support for new provisioners, providers and other utilities. For a list of currently available Vagrant plugins take a look here. Vagrant initial goal was to speed up the creation of virtual environments for development. However, virtual environments has a broader use case. One of the common uses of Virtualization is to set up practice labs, and I will demonstrate how we can do it by using Vagrant. Your company using Nagios as its monitoring solution and your team is responsible for maintaining it. You have new personal on your team which isn’t familiar with Nagios and you’ll like to do few training sessions for them. For the training session you want each member to have its own sandbox environment to play with. Almost no time to first boot. Relatively easy process (if you are familiar with Virtualization). Access to the internet is not needed (the image can be saved on USB, local file server, etc). Users usually not aware how the environment inside the virtual machine was created. Can be time consuming to update image with new components. Might need to provide additional instructions to users about how to set up the virtual environment (Assign more CPUs and RAM, network settings, etc). To overcome some of the disadvantages above lets try to setup our lab environment by using Vagrant and VirtualBox. Note: I’m not suggesting in any way that using Vagrant doesn’t come with its own set of disadvantages. Vagrantfile is really a ruby file (or more specifically a Ruby DSL). While this makes the configuration look a bit weird for the average joe, it’s nothing to be worried about and can be pretty powerful feature when needed. The outer block creates the main configuration object. Think of it as creation of an object (named ‘config’) that will hold all our settings. VAGRANTFILE_API_VERSION is a variable storing the value “2”. This represent the version number we want out config object to work with. This is mainly done for backwards compatibility between recent versions of Vagrant and older ones. If you are not sure about it, just leave it as is. Here we use the config object to set our Vagrant base box to ubuntu/trusty64. More about where this box comes from later in the tutorial. Here we create provider specific config block. In our case we ask that if machines are being run with VirtualBox provider, then each machine should receive 2 vCPUs by default. Each provider expose different set of options, so provider specific settings needs to be in separate blocks. Network config is something that gets special treatment in Vagrant. While it is possible to configure Network via the provider block configuration, Vagrant tries to abstract as much as possible of the (usually) tedious network configuration into few high level settings. In our case, we ask Vagrant to configure private_network networking and assign IP addresses via DHCP. private_network means that each machine will get private ip address from the private address space and machines will be able to communicate with one to another via these addresses. I choose to use DHCP instead of static IPs because I would like my Vagrantfile to be bit more portable. Choosing static IPs could mean collisions with local networks at home or work. Hostmanager config namespace is not a part of core Vagrant install. It is added by using the Hostmanager Vagrant plugin. This plugin allows a dynamic edit of host file on host and guest machines. It allows us to skip hardcoding IPs into our configuration and to work with hostnames instead of IPs. So later on when actually working with Nagios I can refer to server as nagios-server instead of its IP. Note for Windows users: In Windows, VBoxManage.exe is not in the %PATH%. You’ll want to add VirtualBox’s directory (usually something like C:\Program Files\Oracle\VirtualBox) into the PATH variable for this to work. These are two blocks doing the same thing – defining a virtual machine. First line of each block defines machine hostname. Second line of each block defines a synced folder between host and guest machine. These are the folder of Nagios configurations which will allow us to quickly reconfigure Nagios server and Nagios client without the need to SSH into the machine. Third line of the first block defines a port forwarding. This is done mainly for example only since we use private_network and can access machine by IP instead. Last line of each block describes what provisioner we want to use. In our case we would use the simple shell provisioner. Vagrant will copy the files specified in path and execute them after machine is up and running. 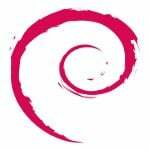 The server-provision & client-provision files exists inside the tarball. I will not review them in this tutorial. In this section we will initialize our Vagrant environment. Usage: vagrant [options] <command> [<args>] -v, --version Print the version and exit. -h, --help Print this help. Common commands: box manages boxes: installation, removal, etc. connect connect to a remotely shared Vagrant environment destroy stops and deletes all traces of the vagrant machine global-status outputs status Vagrant environments for this user halt stops the vagrant machine help shows the help for a subcommand init initializes a new Vagrant environment by creating a Vagrantfile login log in to Vagrant Cloud package packages a running vagrant environment into a box plugin manages plugins: install, uninstall, update, etc. provision provisions the vagrant machine rdp connects to machine via RDP reload restarts vagrant machine, loads new Vagrantfile configuration resume resume a suspended vagrant machine share share your Vagrant environment with anyone in the world ssh connects to machine via SSH ssh-config outputs OpenSSH valid configuration to connect to the machine status outputs status of the vagrant machine suspend suspends the machine up starts and provisions the vagrant environment version prints current and latest Vagrant version For help on any individual command run `vagrant COMMAND -h` Additional subcommands are available, but are either more advanced or not commonly used. To see all subcommands, run the command `vagrant list-commands`. 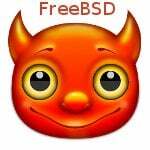 init – Create Vagrantfile in current directory. 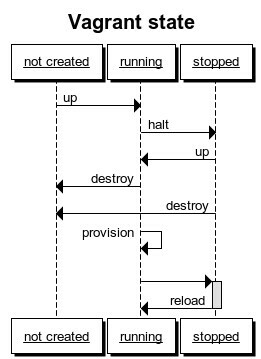 halt – Shutdown environment. Equivalent to powering off machines. provision – (re)Run provision scripts as defined in Vagrantfile. destroy – Stop and delete environment. reload – Will restart environment and apply new setting from Vagrantfile without destroying. ssh – SSH into machine. status – Get environment status to see whether machines are running or not. Vagrant commands are executed on all machines in the environment. For example in our case, running vagrant up will cause vagrant to start and provision two virtual machines (server & client). If we wanted to create only one of them, we could do vagrant up server and only the server virtual machine would be initialized by vagrant. 1==> server: Successfully added box 'ubuntu/trusty64' (v14.04) for 'virtualbox'! 5==> server: Machine booted and ready! 1 At first Vagrant looks for a base box (ubuntu/trusty64), once it doesn’t find it, it will download it from vagrantcloud.com (unless configured otherwise). 2 After download is finished, it will import the image into Virtualbox. 3 Vagrant will rename the machine in Virtualbox to the name specified in the log. If you open Virtualbox, you’ll find a running machine with this name. 4 Port forwarding takes place. 5 After machine is running and ready Vagrant will mount shared folders, edit hosts file (hostmanager plugin) and execute provision shell script that was copied to the machine. 6 Notice that the second machine won’t re-download the box before importing it since it was saved to Vagrant’s cache in the first time. The whole process took between 10 and 15 minutes on my computer including downloading of the base box. So in case I would like to re-create the whole environment from scratch again, it’s going to take less then 10 minutes. $ vagrant status Current machine states: server running (virtualbox) client running (virtualbox) This environment represents multiple VMs. The VMs are all listed above with their current state. For more information about a specific VM, run `vagrant status NAME`. $ vagrant ssh server -c "service nagios status"
$ vagrant ssh server -c "service nagios status" nagios (pid 4154) is running... 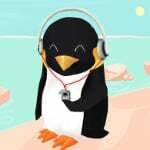 Connection to 127.0.0.1 closed. If you browse around the menus you should see that currently Nagios is only configured to monitor itself. In the next part we’ll add the configurations needed so Nagios will start monitoring the client machine as well. If you list your folder content after provisioning is finished, you should find two new directories which wasn’t there before we ran vagrant up. $ vagrant ssh server -c "sudo service nagios restart"
In your browser under “Host Groups” you should see new host with the name client and its status should change to UP after few seconds. 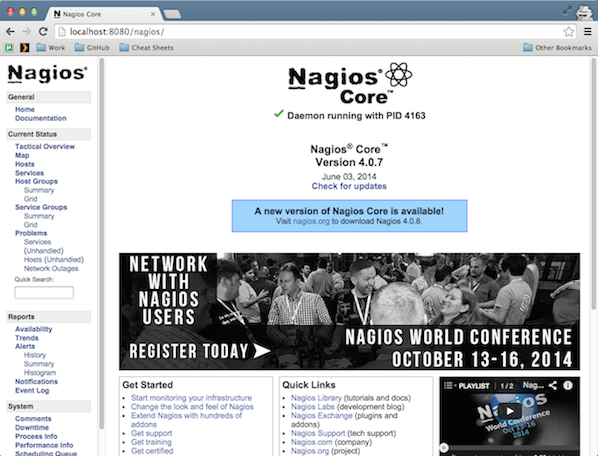 We have instruct Nagios to watch add new configuration file and in that file we defined new host Nagios should monitor. The address of the new host is nagios-client and its being resolved to the correct address because of the hostmanager plugin which dynamically edits /etc/hosts file and added the correct IP addresses of nagios-client machine. $ vagrant ssh client -c "sudo service nrpe restart"
Restarting nagios remote plugin daemon: nrpe. So we created our small Nagios lab environment where we can experiment with different Nagios configurations, plugins and so on. The whole environment is defined in bunch of script files which you can store in your source repository such as Git. Your co-workers can now simply download these configuration files to their machine and run vagrant up and in the end of the process get exactly the same environment as you have on your machine. Portability can be tricky thing and there are couple of thing you need to watch out for when you work with Vagrant. First of all, make sure you all work with same Vagrant versions. Vagrant fixes a lot of issues between releases (and obviously adds a bug or two as well) so you want to be on the same page when running Vagrant. You can include Vagrant.require_version helper config in your Vagrantfile to force only specific versions of Vagrant to run your config. puts "plugin is missing. Bye!" Generally though, you want to minimize the number of 3rd party plugins to essential minimum. Vagrant doesn’t support running Vagrantfile with multiple number of providers at the same time. However you can run same Vagrantfile with different providers separately (using the --provider flag). However, supporting multiple providers in same Vagrantfile can be tricky as well since some options and features are not the same between providers. So for best compatibility you might want to decide to work with specific provider only. In our tutorial we assume that VirtualBox is used since we use the VBoxManage command line utility to find the IP address of our virtual machines. Running it under VMWare will cause hostmanager to act differently. Another point you want to be extra careful with is running Vagrant on different OS. In our tutorial for example, the path of VBoxManage.exe needs to exists in the PATH variable or else hostmanager will fail. This article was contributed by Michael Sverdlik. You can too contribute to nixCraft. Thanks chief that was great! Thanks for the post. 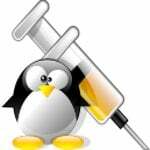 I tried to create own VirtualBox box using – http://sysadm.pp.ua/linux/sistemy-virtualizacii/vagrant-box-creation.html . But didn’t found OpenVZ provider box creation. Did anybody faced with it? Yeah really great article and lots of tips . Like it too. Instructions worked perfect for me except I had to run the command “vagrant hostmanager” after the server and client had been setup to get the etc/hosts file to update. Thank you! Thank you for such detailed article. Very cool. Liked it. I freelance from comfort of my home, by completing various simple jobs that only requires from you desktop or laptop computer and access to internet and I am so happy with it… After six months on this job and i got paid so far in total 36,000 bucks… Basicly i get paid 80 bucks/hourly and work for three to four hours a day.And the best part about it is that you can make your own schedule when you work and for how long and you get paid at the end of each week. https://puphpet.com/ is awesome for creating templates for vagrant to get a new project started. It is a bit complex. I dislike the programmatic format if you don’t already have a git/svn infra to make it work.